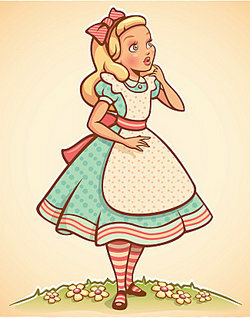 Alice in Wonderland is more than just the kid's story you may have thought it was when you were younger. It refers to two novels: Alice's Adventures in Wonderland and Through the Looking Glass as well as the many movies based on these books. Many of the quotes will cause you to ponder, philosophize and wonder. With a little imagination and a few more years under your belt, there are plenty of "trippy" quotes to be had in the movie or book version of this famous story. These interesting quotes from Alice in Wonderland are fun as personal mottos, to quote to friends or just to read and enjoy. Found some you think we should add? Feel free to comment with your favorites. "What Are Some Trippy Quotes from Alice in Wonderland?." YourDictionary, n.d. Web. 21 April 2019. <https://quotes.yourdictionary.com/articles/trippy-quotes-alice-in-wonderland.html>.